Welcome Readers! I am honored to host the July 17, 2008, edition of the Vegetarian Blog Carnival. Like I mentioned, a carnival is a collection of recent posts on a particular topic from various blogs on the web. As you can probably guess from the title, this carnival's topic is vegetariansim and anything related it. Thanks to all who participated! To start off, Jul from Veggie Chic provides an excellent guide to which fruits and vegetables are best to buy organic in her post called New in My Wallet: Organic Fruit and Veg Guide. The guide is very easy to remember since it focuses on 12 "clean" and "dirty" produce items. As the post title implies, you can print out the list and put it in your wallet, making it even more convenient. Jul is also the original host of these wonderful carnivals. The next post from Davexplorer describes tips that can be applied to make vegetarian cooking as natural as possible. His post titled What is natural cooking? on the Natural Cooking Blog lists general steps that can be taken. Lane Wright has a Petition to Oprah - Livestock Should be Treated Humanely Vegan Bits at Vegan Bits where she discusses how topics such as how eating meat affects the planet. You can choose to sign the petition as well. Now let's move on to recipes. Theo presents a creamy Blueberry, Pineapple, and Strawberry Smoothie at Organic Test Kitchen. 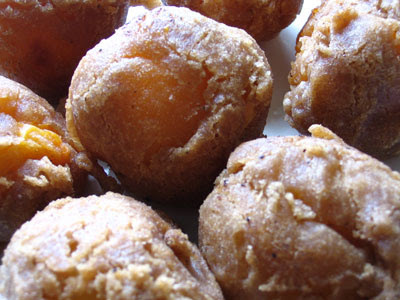 Lisa provides a recipe for decadent Apricot Rum Fritters in Lisa's Vegetarian Kitchen. She recommneds the fritters are as a breakfast dish. The fritters sound very flavorful and elegant based on her post. An interesting way to make to make pectin-free Strawberry Preserves is shown by valereee at Cincinnati Locavore. She prefers to make the preserves without pectin because she finds that pectin makes the "texture seem rubbery instead of gooey". As a main course for two, Kathy Hester (GeekyPoet) presents Vegan Polenta with grilled eggplant and heirloom tomato sauce at Geek, Poet, Housewife Wannabe. She explains how to make the dish on an outdoor grill. I have always wanted to try polenta, and this looks like a great recipe for me to use to try it. 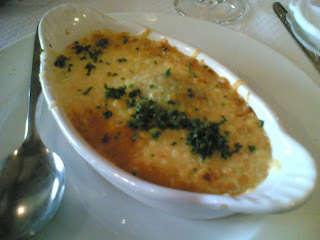 To serve as a main course or sundry, Matthew Stevenson gives us Broccoli, Potato & Onion Gratin on The Chef's Day Off. Just the picture itself looks mouth-watering. Amanda Milne discusses vegetarian dishes that can be served at dinner parties or barbecues in Vegetarian Cooking Series-Part 2-Pub and Casual Foods on her site Value For Your Life. Naomi presents details on how Broccoli Fights Prostate Cancer at Diary From England. She also provides a link to a recipe for broccoli and chili penne. Raymond reports on the Boca burger in Healthy Vegetarian Burger Meals on the Money Blue Book Personal Finance Blog. He provides information on their nutritional value and his reasons for preferring them. And that's a wrap! The next carnival is scheduled for August 5th and will be hosted by antiaging4geeks impulse. To have your post featured in the next Vegetarian Blog Carnival, click here. Great job, Sarah. Thanks for hosting. Thanks for including my post as a part of my vegetarian cooking series in the carnival. BTW, cool site!